It's International Cheetah Day! I don't think it comes as a shock to anyone anywhere that I'm a huge cat person. Love love love cats. But as far as big cats go, cheetahs have always held a special place in my heart. 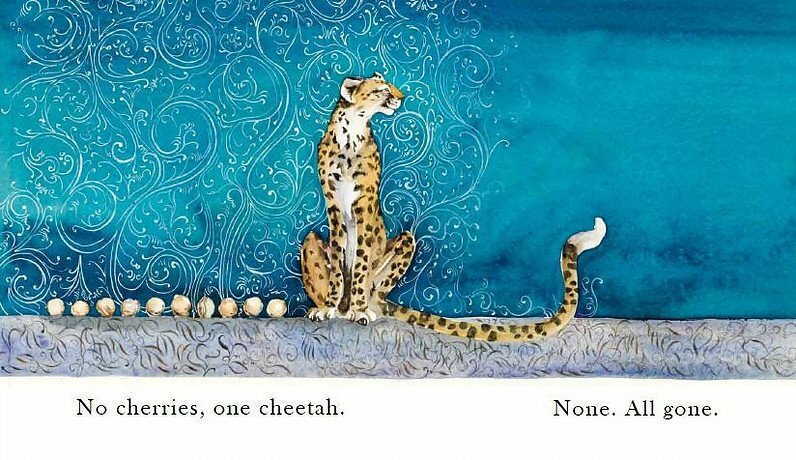 In honor of the coolest cats around, I'm so excited to show you One Cheetah, One Cherry: A Book of Beautiful Numbers by Jackie Morris. 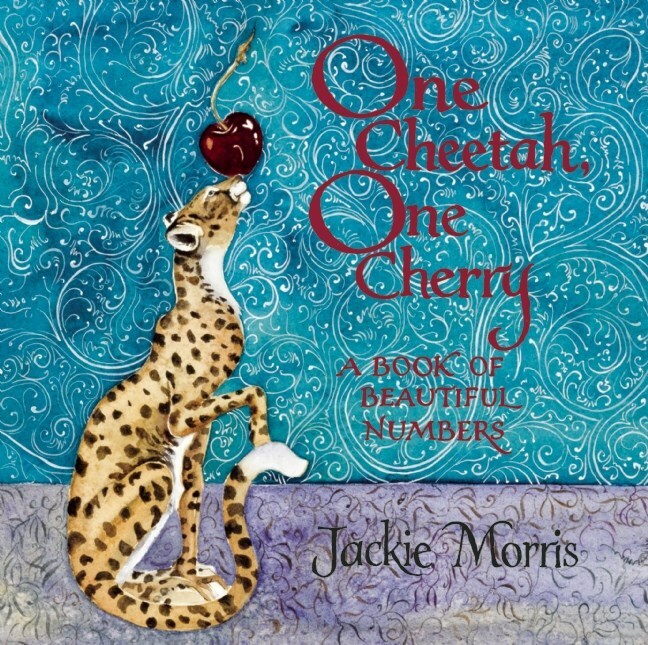 One Cheetah, One Cherry is a concept book about numbers. We see one cheetah with one cherry, two dogs with two balls, three bears with three meals, and so on. The watercolor and gold leaf illustrations are rich with color and present the animals and their hobbies as regal paintings. It's a shame that we don't really get a sense of how the gold leaf is used, but if you visit Morris' website, she has some great photos that show how she uses it. There are actually a ton of different animals in this book, but I was most drawn to the cheetah images, so that's what I'm showing you today! Every animal is beautiful illustrated and paired with an equally amusing object--foxes with strawberries, pandas with parasols--and the book escalates from "one cherry, one cheetah" to "ten cherries, one cheetah" and eventually to "no cherries, one cheetah." One Cheetah, One Cherry has a nonsensical feeling to it. The cheetah is the only animal we see more than once (we see her three times), and her reappearance gives the book somewhat of a narrative, albeit a nonsensical one. It's a beautiful read and a fun way to learn about numbers!